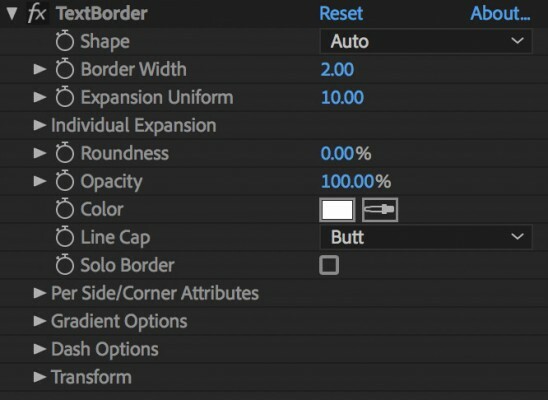 TextBorder is currently compatible with CS6 to CC2018. Note that the 2018 version has better rotation mechanics, so it's recommended to use this version. Limitations: TextBorder is compatible with 3D text layers but does not take into account 3D transformations. Rest assured it does take into account 2D (X&Y) transforms. TextBox is TextBorder's spirit-plugin that also draws a fill for text layers. If you find TextBorder useful then you'll likely love TextBox! We've added some new features to TextBorder such as gradient fill, dashes, individual expansion, general performance increases and more which will soon be making an appearance in TextBox.